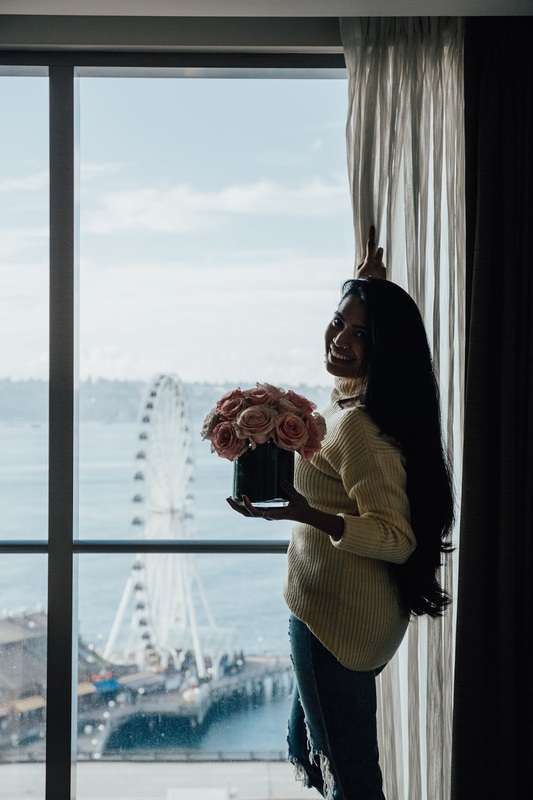 Thanks to Four Seasons Hotel Seattle for sponsoring this post. As always, all opinions in the post are my own. Can you believe that? Yep, I know, me either! P.S: Whether you have stuck around with me from the very beginning or if you are new around here, I am, as always, incredibly grateful for each and every one of you and your genuine support and love, it means the world to me!!! 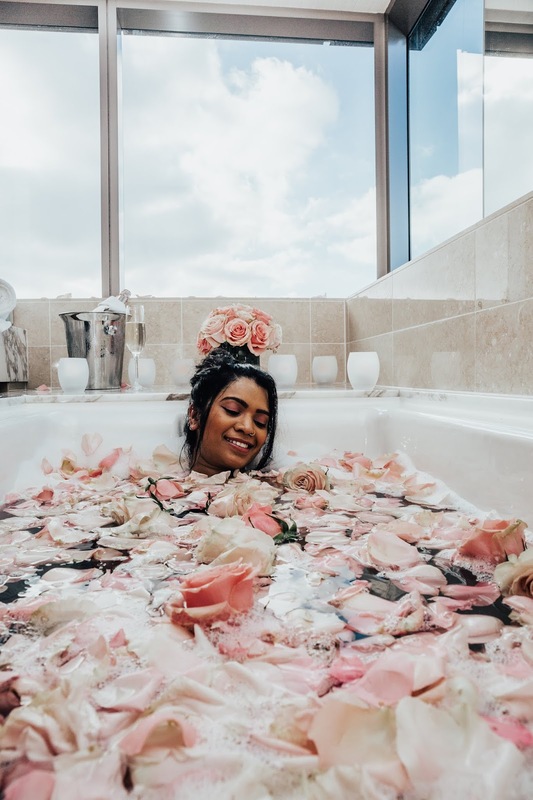 I still can’t believe that I quit the corporate world, took a big leap of faith and jumped straight into being a blogger, being a content creator, and being a social media marketer, not having a freaking clue about the world of blogging (or the first thing about it) or using social media for business. And to be able to wake up with this kind of passion and this kind of desire, every.single.morning, I consider myself truly blessed! * What could I share this time that I haven’t shared before? * What could I write here that I haven’t written before? * What could I say to you all that I haven’t said before? Case in point, when every.single.successful person you have ever come across says ‘niche down’ and write about one or two topics. Sure, I hear you and I understand why that is crucial and important. If you have been around this blog long enough then you know that I write/share about a whole range of topics. 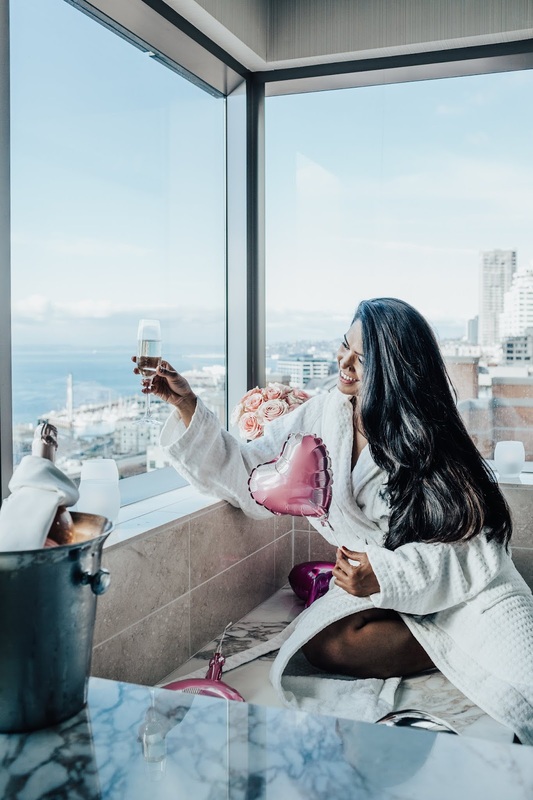 And if I listen to others and niche down to say share only about travel and fashion, then it would only mean that I am doing injustice to what I do and to myself and to all those other things that I am truly passionate about (say cooking or motherhood, etc). And do you want to you know what some of the big brands that I have worked with have had to say about that? Which is exactly what my goal has been from day 1 and it literally gives me goosebumps to hear that that is exactly what the other brands see when they see my brand and reach out to partner with me. If you ask what that one that thing is for me? I will, without a doubt, and without second-guessing myself, say that that one thing I am extremely passionate about is creating content and sharing that content with you all. 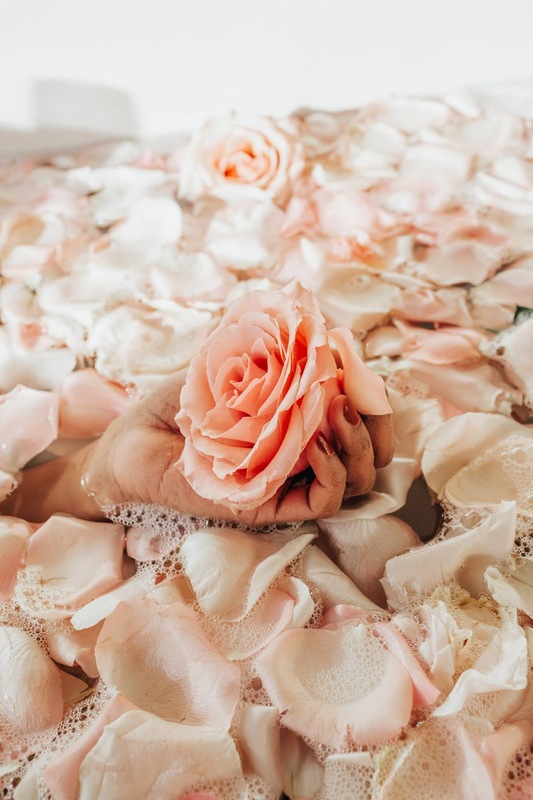 Penning down (once I am over that initial writer's block there’s no stopping me haha) and sharing information about all the things I learn about and love with you all gives me the ultimate satisfaction, (which is why I started this blog in the first place). Nothing brings me more joy than when I share something, say for example, about meal prepping, and then get your DMs about how much you love that type of content and just how helpful it has been to you. But in order to continue to be a content creator one needs to take care of a few dozen things in the background to keep things up and running. Like all the admin stuff, negotiating with brands, reviewing contracts, taking care of the technical difficulties (all.the.time) and so on and so forth, cuz that list is far too long for this post. But you get the point, you can’t just do that 1 thing and call it a day, you still need to be invested in doing all those other things that support your true passion, whether you like it or not. And maybe one day I will get to a point when I can hire people to do those things for me, but for now, it is a one-woman ship (with my co-captain, my darling hubby, right next to me of course. I have said it before and I will say it again, without him and his unconditional support I just wouldn’t be doing what I do). This one I am incredibly proud of… I have always made it a point, from the very beginning, to take breaks from creating content, from being on social media, and to completely switch off from time to time. Because, whoever said ‘Do what you love, and you'll never work another day in your life’ told us all the biggest lie ever. In the last 3 years, if there is one thing that I have learned then it is doing what you love and you are always working, 24/7, and 365 days a year. 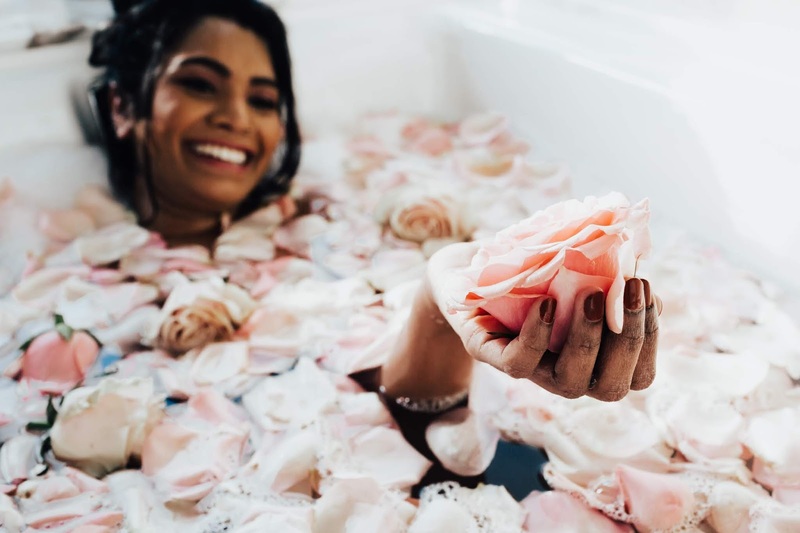 There will always always always be something that needs to get done when you run your own business, and you could always be doing that 14th thing (when you really only have 10 on your list) to become more successful. But you need to learn to take a break and know when to stop. Work-life balance is so essential for our health and well-being. It is so essential to take breaks, for a day or for a few days so you can come back reenergized and refreshed. Or it is sure to burn you out, sooner or later. I see so many successful people always working, always being on social media (even when they are on vacations, even on the weekends) and I am like, wow, props to you for all your hard work, but I hope you realize the biggest mistake you are ever making and hope that you will fix it before its too late. 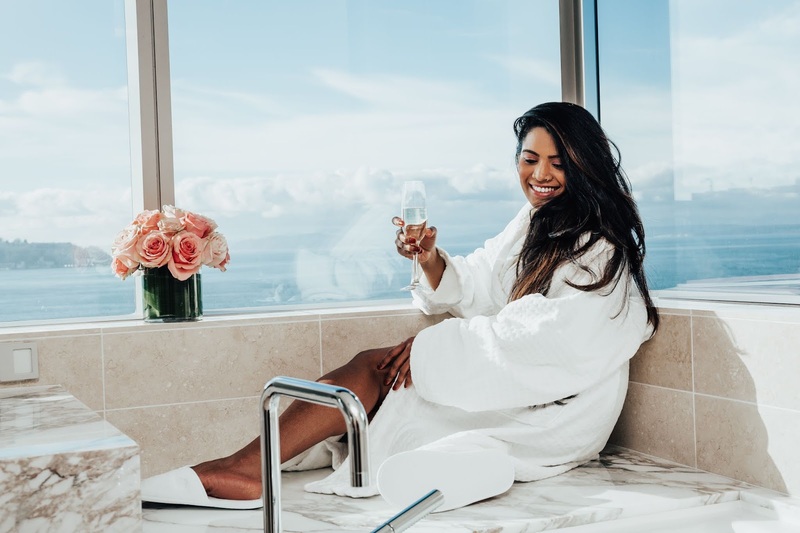 First and foremost, the Four Seasons Hotel brand in itself needs no introduction or convincing of course, but I will go on anyway ;). 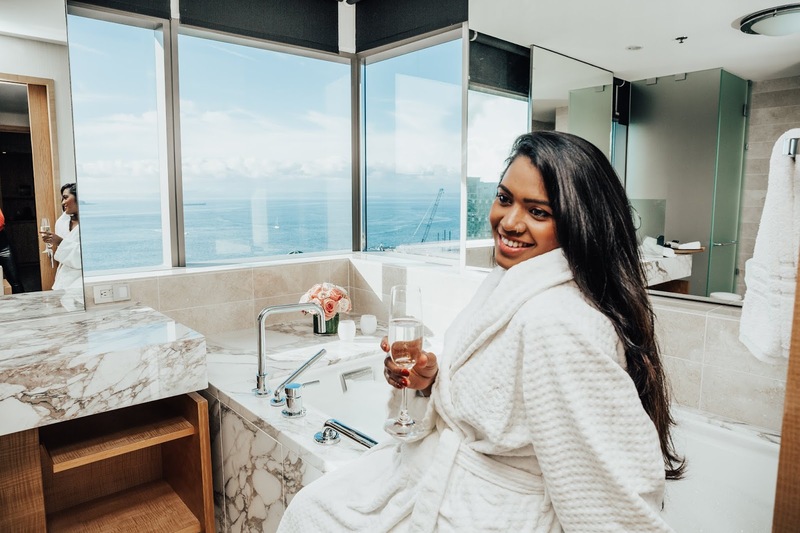 The amenities and staff are on point, duh, it’s of the Four Seasons - infinity pool and jacuzzi (both our absolute favorite! ), fitness center, steam room, and an on-site restaurant serving delicious food. 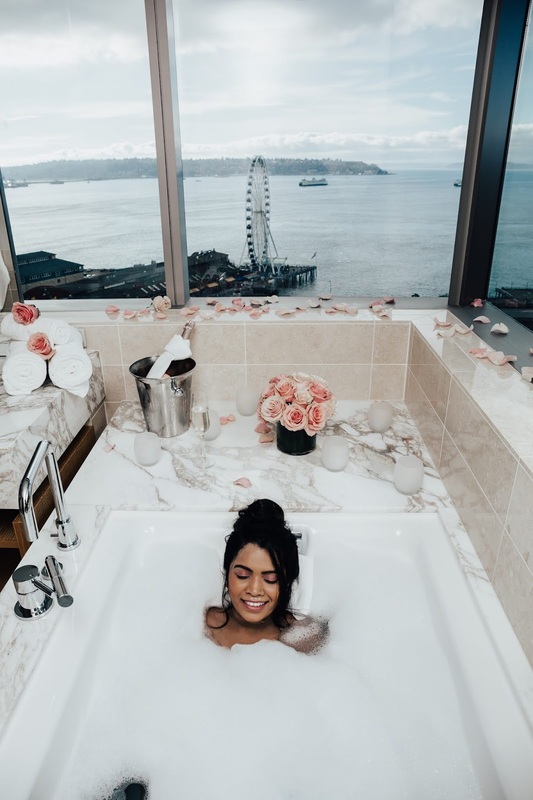 Location, location, location, the hotel is located right in the heart of Seattle’s downtown and makes it the perfect base for anyone visiting Seattle. And perfect for both, business or pleasure trips. The views from up here of the Puget Sound, Elliott Bay, Seattle Great Wheel, and everything around it are to die for. 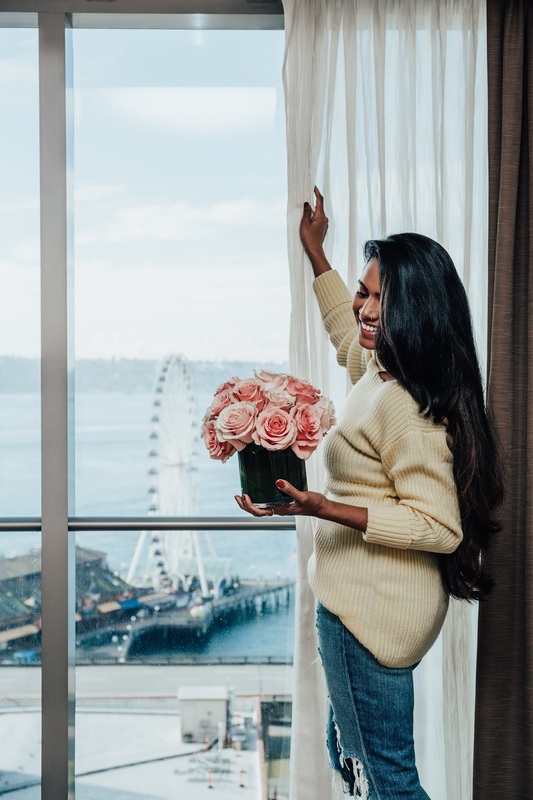 Many tourist attractions like the iconic Pike Place Market, the Seattle Art Museum, etc are just a few minutes walk from the hotel. 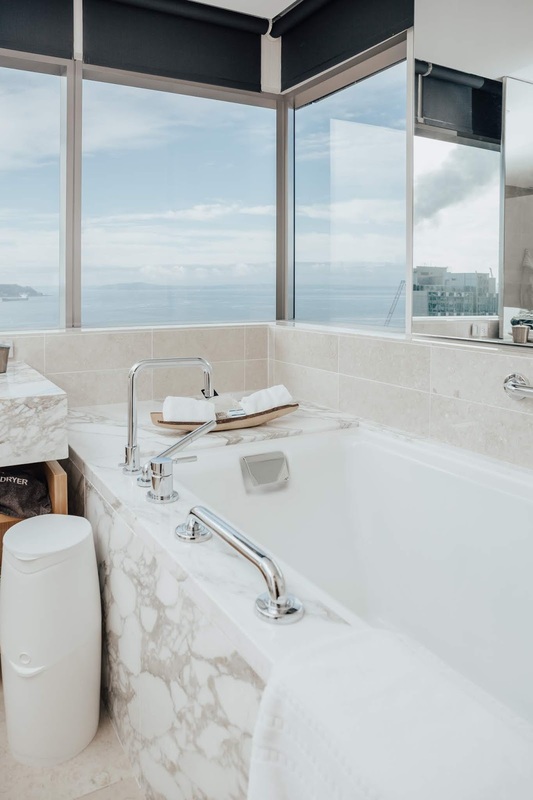 Four Seasons is the only hotel in Seattle to have deep soaking tubs and separate rain showers in every guest room and suite. 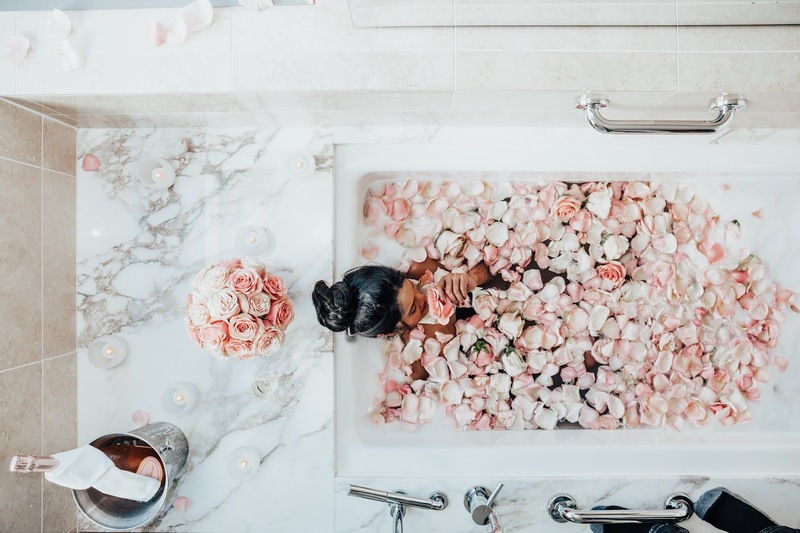 And now they have introduced a bath experience with a new menu of signature salts and scrubs for guests to enjoy. 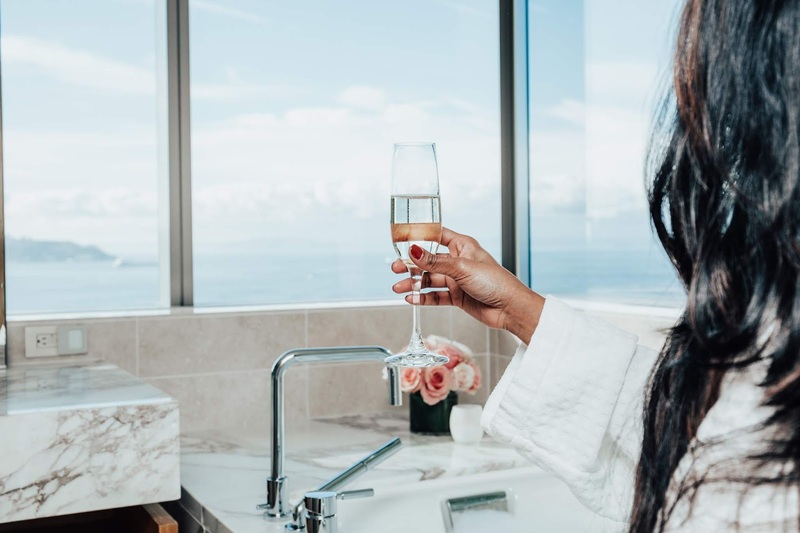 Luxury at it’s best, don't you agree!? 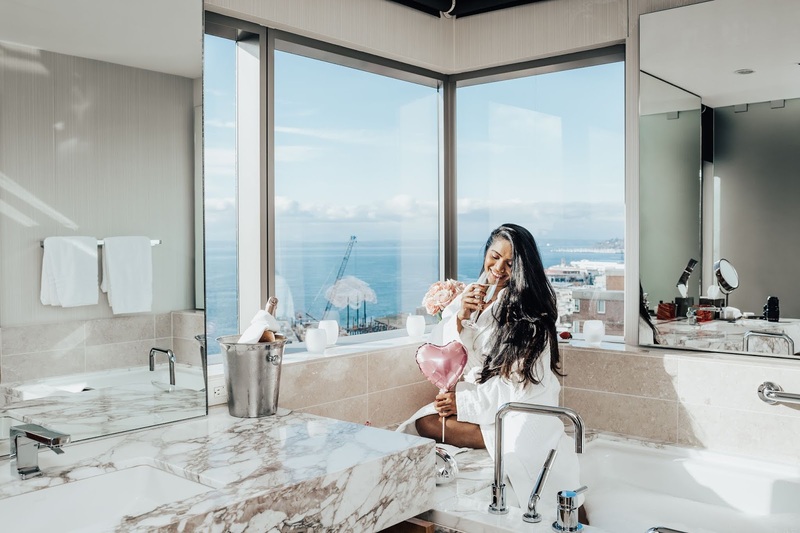 You have 2 scents to choose from for your bath experience and each is personalized with the guest and location in mind. 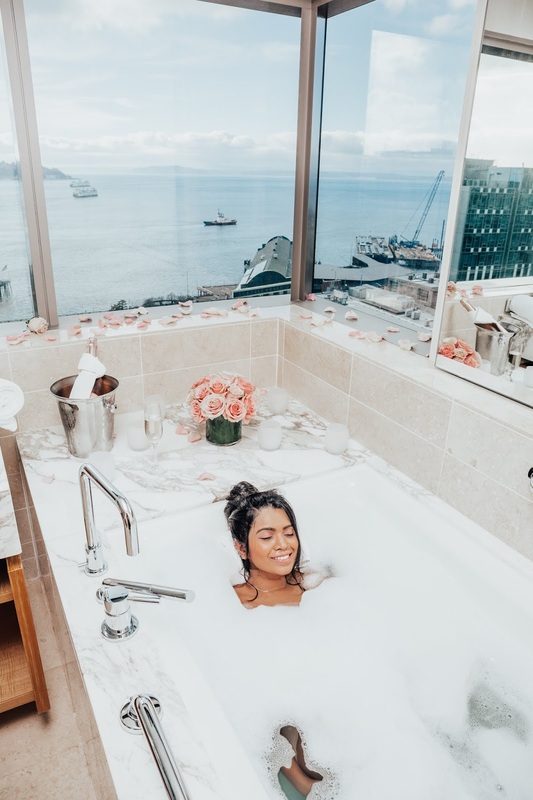 Seattle Signature - Evoking the scents of the Pacific Northwest, the Seattle Signature Bath Experience features a cedar and saffron salt with woodsy, spicy and vanilla notes; LaNatura Green Tea Sugar Exfoliator; and LaNatura Sea Water Therapy Shea Butter. 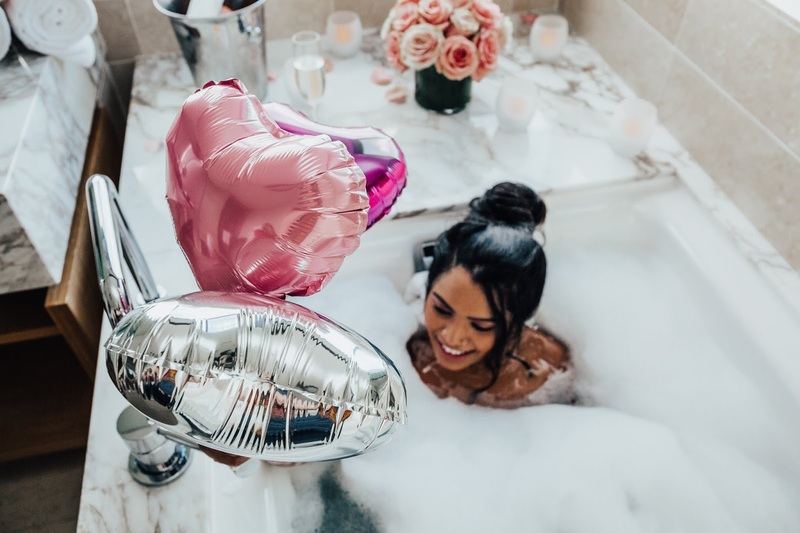 Romance - Perfect for an evening of indulgence, the Romance Bath Experience includes amber-scented therapeutic bath salts for a warm, rich, honey-like, and earthy scent. It is paired with LaNatura Green Tea Sugar Exfoliator and LaNatura Jasmine Shea Butter. 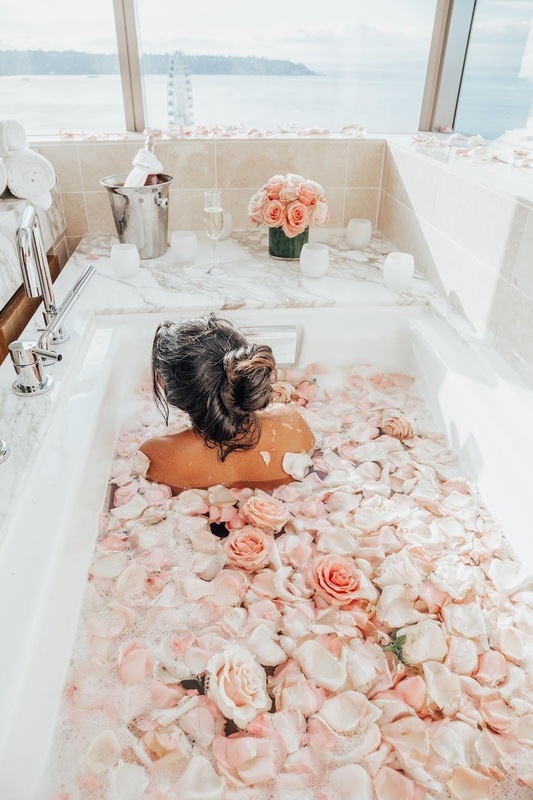 Each kit includes bath salts, a body scrub, and body shea butter. 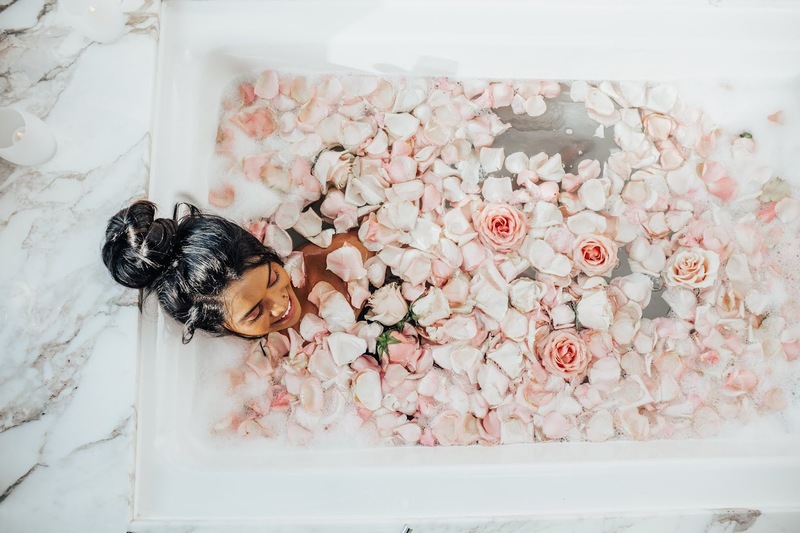 With invigorating and healing qualities of the scrub and smoothing and moisturizing benefits of the shea butter, the overall result is a feeling of rejuvenation and relaxation in their amazing deep soaking tubs. 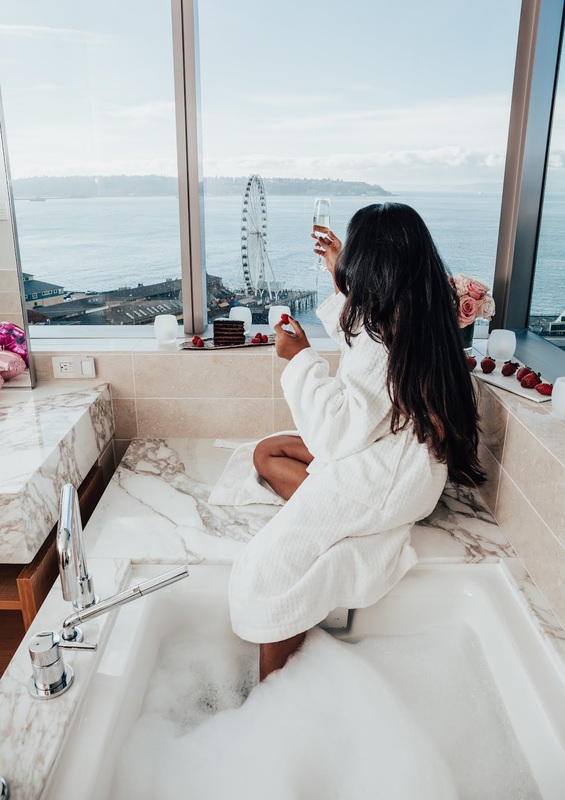 So what are you waiting for, get on that flight to Seattle, stay at the Four Seasons Hotel Seattle and pamper that special someone or yourself with one of the most unique in-room intimate spa services ever!